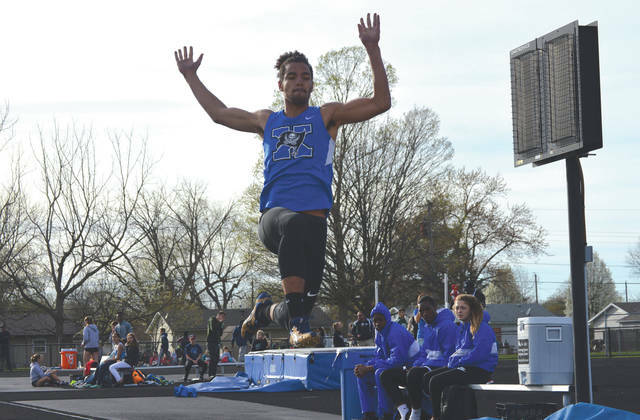 Xenia’s Zack Gaither placed ninth in the boys long jump competition with a jump of 19 feet 1/4 inches, April 12 at the Doug Adams Invitational track and field meet. 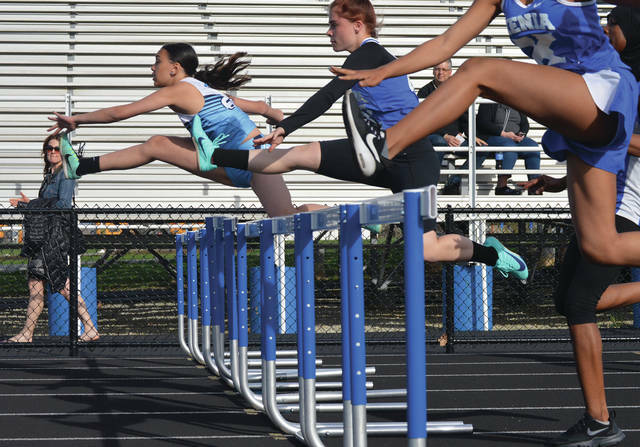 Fairborn’s Ashley Sheridan gets out in front of a field of four Xenia hurdlers, in an early heat of the girls 100-meter hurdles event, April 12, in Xenia. 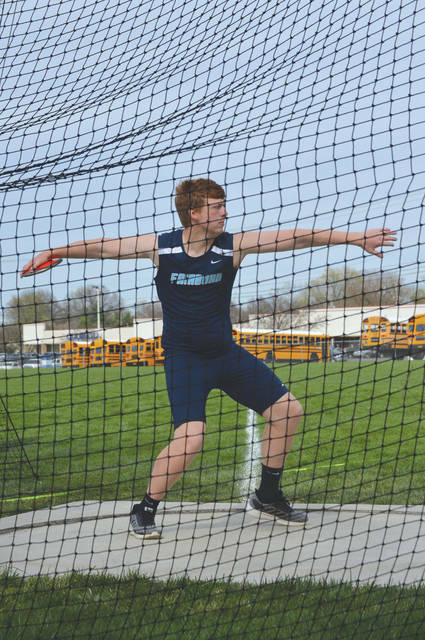 Fairborn’s Brodie Newell uncorks a throw in warmups for the discus competition, April 12 at the Doug Adams HS Invitational track and field meet in Xenia. 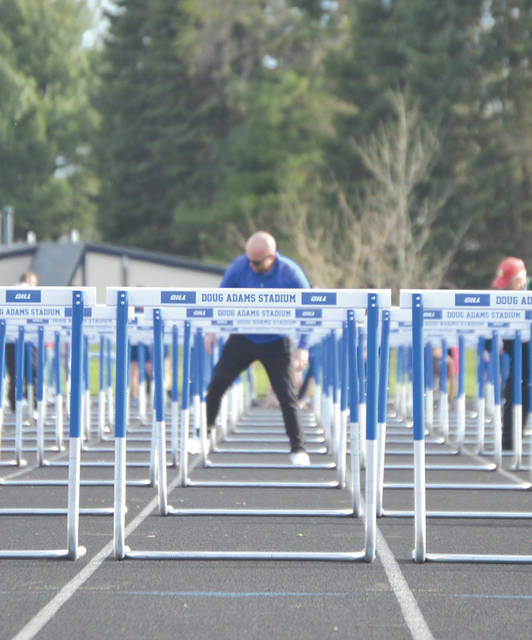 Xenia HS Athletic Director helps set up the hurdles during Friday’s Doug Adams HS Invitational track and field meet, held at Doug Adams Stadium, in Xenia. 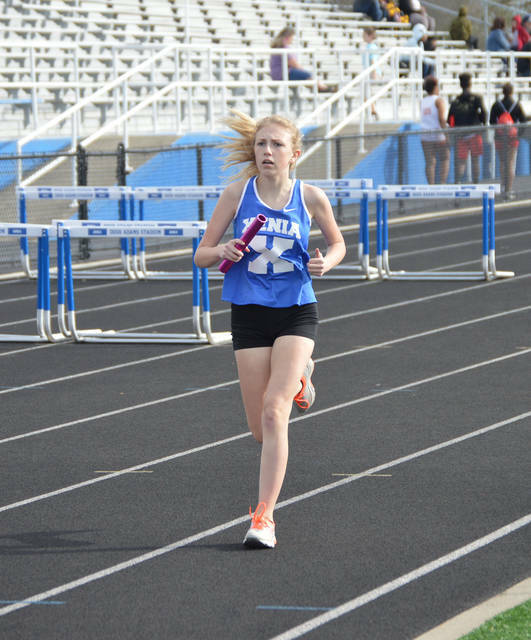 A member of Xenia’s girls 3,200 relay team starts her second lap, during Friday’s Doug Adams HS Invitational track and field meet in Xenia. XENIA — A dozen area high schools converged on Doug Adams Stadium for the aptly named Xenia Doug Adams High School Invitational track and field meet, April 12. As the sun set on the day’s events, Springfield was leading the boys team scores with 14 of 17 events scored with 115 points, with Troy second (93) and Fairmont third at 83. Locally, Fairborn was ninth, with Xenia and Xenia B 11th and 12th respectively. On the girls’ side of things, Troy was dominating the points chase with 140 points with 12 of the meet’s 17 events scored. Fairmont was a distant second with 60.5 points, with Northmont third at 44. Host Xenia was listed in eighth overall with Fairborn 10th. The event is held in recognition of Doug Adams, a former Xenia High School student athlete who went on to win the 1968 national championship for Woody Hayes at The Ohio State University. He also played four years with the NFL’s Cincinnati Bengals. While bicycling, Adams was struck and killed by a car, whose driver had fallen asleep at the wheel, in 1997. The Doug Adams Trust fund was crucial in the formation of the present XHS track and field facility.